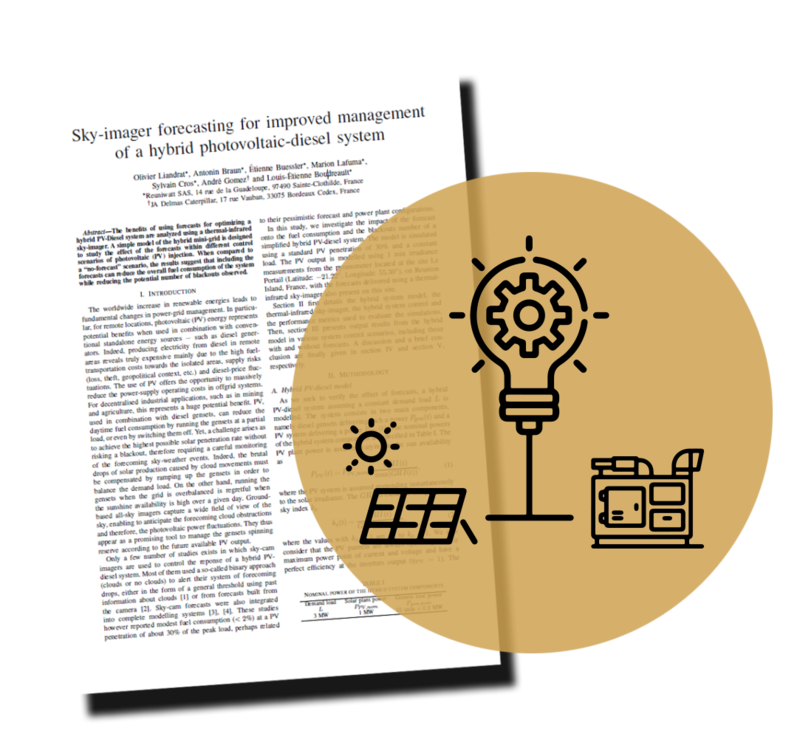 Do you want to know more about how sky imagers help improve management of hybrid PV-diesel systems? Sébastien N., Lallemand C., Cros S., Kurzrock F., Schmutz N., UVeka: a UV exposure monitoring system using autonomous instruments network for Reunion Island citizens, European Geosciences Union General Assembly 2016, Apr 2016, Vienne, Austria. Vol. 18, pp.EGU2016-16482, 2016, Geophysical Research Abstracts. Kurzrock F., Cros S., Sébastien N., Chane-Ming F., Linguet L., Potthast R., Lajoie G., The use of satellite data assimilation methods in regional NWP for solar irradiance forecasting, European Geosciences Union General Assembly 2016, Apr 2016, Vienne, Austria. Vol. 18, pp.EGU2016-15821-1, 2016, Geophysical Research Abstracts. Cros S., Buessler E., Huet L., Sébastien N., Schmutz N., The benefits of intraday solar irradiance forecasting to adjust the day-ahead scheduled PV power, 5th Solar Integration Workshop – International Workshop on Integration of Solar Power into Power Systems, October 19-20 2015, Brussels, Belgium. Lorenz E., Kühnert J., Heinemann D., Nielsen K. P., Remund J., Müller S.C., Cros S., Comparison of irradiance forecasts based on numerical weather prediction models with different spatio-temporal resolutions, In Proceedings of the 30th European PV Solar Energy Conference, 14-18 September 2015, Hamburg, Germany. Sébastien N., Zanchetta P., Huet L., Nitche N., Cros S., Schmutz N., Day-ahead solar radiation forecasting using GFS and artificial neural networks, 15th European Meteorological Society (EMS) Annual Meeting & 12th European Conference on Applications of Meteorology (ECAM), September 7-11 2015, Sofia, Bulgaria. Cros S., Thomas R., Turpin M., Lallemand C., Sébastien N., Schmutz N., Intraday solar energy forecasting using cloud motion observation from satellite combined with WRF irradiance forecasts, 15th European Meteorological Society (EMS) Annual Meeting & 12th European European Conference on Applications of Meteorology (ECAM), September 7-11 2015, Sofia, Bulgaria. Cros S., Turpin M., Verspieren Q., Lallemand C., Schmutz N., Pignolet C., Mapping surface solar irradiance over Japan and Australia using MTSAT-2 and MODIS, 30th International Symposium on Space Technology and Science, 4-10 July 2015, Kobe-Hyogo, Japan. Cros S., Turpin M., Lallemand C., Verpieren Q., Schmutz N., Soleksat: a flexible solar irradiance forecasting tool using satellite images and geographic web-services., 3rd International Conference for Energy & Meteorology, 23-26 June 2015, Boulder, CO, USA. Cros S., Sébastien N., Liandrat O., Jolivet S., Schmutz N., Solar power forecasting for a massive and secure injection of photovoltaics on the grid, 4th Solar Integration Workshop – International Workshop on Integration of Solar Power into Power Systems, November 10-11, Berlin, Germany. Cros S., Liandrat O., Schmutz N., Advantages and drawbacks of a statistical clear-sky model: a case study with photovoltaic power production data, 14th European Meteorological Society (EMS) Annual Meeting & 10th European Conference on Applied Climatology (ECAC), October 6 -10 2014, Prague, Czech Republic. Nitche N., Trombe P-J., Cros S., Using cloud fraction derived from all-sky camera to improve beam solar irradiance forecasting by time-series modelling, 14th European Meteorological Society (EMS) Annual Meeting & 10th European Conference on Applied Climatology (ECAC), October 6 -10 2014, Prague, Czech Republic. Cros S., Liandrat O., Sébastien N., Jolivet S., Schmutz N., Solar energy forecasting using Meteosat Second Generation Optimal Cloud Analysis and cloud motion vectors derivation from MSG HRV channel, In Proceedings of the 2014 EUMETSAT Meteorological Satellite Conference, September 22-26 2014, Geneva, Switzerland. Cros S., Sébastien N., Liandrat O., Schmutz N., Cloud pattern prediction from geostationary meteorological satellite images for solar energy forecasting, Proc. SPIE 9242, Remote Sensing of Clouds and the Atmosphere XIX; and Optics in Atmospheric Propagation and Adaptive Systems XVII, 924202 (October 21, 2014); doi:10.1117/12.2066853. Trombe P.-J. Cros S., David M., Huet L., Lauret P., Schmutz N., Short-Term Forecasting of Solar Irradiance: a Multiscale Approach, In Proceedings of the 29th European PV Solar Energy Conference, 22–26 September 2014, Amsterdam, The Netherlands. Cros S., Bertin C., Lalire S., Schmutz N, PV Production Forecasts in a Tropical Environment: Cloud Regimes Identification in Reunion Island Using a Ground-Based Cloud Infrared Radiometer, In Proceedings of the 29th European PV Solar Energy Conference, September 22–26 2014, Amsterdam, The Netherlands. Cros S., Jolivet S., Sébastien N., Schmutz N., Using Satellite Data for Intraday Solar Energy Forecasts: Benchmarks of Two Cloud Trajectory Retrieval Techniques, In Proceedings of the 29th European PV Solar Energy Conference, September 22-26 2014, Amsterdam, The Netherlands. Cros S., Liandrat O., Sébastien N., Schmutz N., Extracting cloud motion vectors from satellite images for solar power forecasting, In Proceedings of the 2014 IEEE International Geoscience And Remote Sensing Symposium, July 13-18, 2014, Québec, Canada. Diagne, M., David, M., Boland, J., Schmutz, N., Lauret, P. (2014), Post-processing of solar irradiance forecasts from WRF model at Reunion Island, Solar Energy, 105, 99-108. Oumbe, A., Qu, Z., Blanc, P., Lefèvre, M., Wald, L., and Cros, S.: Decoupling the effects of clear atmosphere and clouds to simplify calculations of the broadband solar irradiance at ground level, Geosci. Model Dev., 7, 1661-1669, doi:10.5194/gmd-7-1661-2014, 2014. Hamard I., Catry T., Richard P-E., Cros S., Liandrat O., Révillion C., Schmutz N., Photovoltaic plant mapping in Reunion Island from very high resolution optical remote sensing: the benefit of Pléiades imagery, Pléiades Days, April 1-3 2014, Toulouse, France. Diagne M., David M., Lauret L., Boland J., Schmutz N., Review of solar irradiance forecasting methods and a proposition for small-scale insular grids, Renewable and Sustainable Energy Reviews, 27(0):65 – 76, 2013. Diagne M., David M., Boland J., Schmutz N., Lauret P., Post-processing of solar irradiance forecasts from WRF model at Reunion Island, 2013 ISES Solar World Congress (SWC 2013), Cancun, Mexique, November 2013. David M., Ramahatana Andriamasomanana F.H., Liandrat O., Spatial and temporal variability of PV output in an insular grid: Case of Reunion Island, 2013 ISES Solar World Congress, November, 2013, Cancun, Mexico. Lauret P., Diagne M., David M., A neural network post-processing approach to improving NWP solar radiation forecasts, 2013 ISES Solar World Congress (SWC 2013), Cancun, Mexique, November 2013. Cros S., Liandrat O., Sébastien N., Schmutz N., Voyant C., Clear Sky Models Assessment for an Operational PV Production Forecasting Solution, In Proceedings of the 28th European PV Solar Energy Conference, September 30–October 4 2013, Paris, France. Cros S., Sébastien N., Schmutz N., Photovoltaic production forecast : the significant role of the meteorological satellites, 13th EMS Annual Meeting & 11th European Conference on Applications of Meteorology (ECAM), September 09-13 2013, Reading, United Kingdom. Oumbe A., Qu Z., Blanc P., Lefèvre L., Wald L., Cros S., Decoupling the effects of clouds and clear atmosphere to compute the solar irradiance at surface, 13th EMS Annual Meeting & 11th European Conference on Applications of Meteorology (ECAM), September 09–13 2013, Reading, United Kingdom. Jolivet S., Sébastien N., Schmutz N., Combining NWP and expert system as a decision-making tool for photovoltaic production forecasting, International Conference for Energy Meteorology, June 25-28 2013, Toulouse, France. Cros S., Sébastien N., Schmutz N., Using meteorological satellite data for photovoltaic production intra-day forecast,International Conference for Energy Meteorology. June 25-28 2013, Toulouse, France. Cros S., Liandrat O., Schmutz N., Classification of meteorological days for the solar radiation forecast in a tropical environment, Second Workshop on Industry & Practices for Forecasting, WIPFOR’13, June 5-7 2013, Paris, France. Diagne M., David M., Lauret P., Boland J., Solar irradiation forecasting: state-of-the-art and proposition for future developments for small-scale insular grids, In Proceedings of the World Renewable Energy Forum 2012 (WREF 2012), Denver, USA, May 2012. Lauret P., Rodler A., Muselli M., Diagne M., David M., Voyant C., A bayesian committee model approach to forecasting global solar radiation, In Proceedings of the World Renewable Energy Forum 2012 (WREF 2012), Denver, USA, May 2012. David M., Diagne H-J., Lauret P., Outputs and error indicators for solar forecasting models, In Proceedings of the World Renewable Energy Forum 2012 (WREF 2012), Denver, USA, May 2012. Cros S., Albuisson M., Lefevre M., Rigollier C., Wald L., 2004, HelioClim: a long-term database on solar radiation for Europe and Africa, In Proceedings of Eurosun 2004, published by PSE GmbH, Freiburg, Germany, pp. (3)916-920. Cros S., Création d’une climatologie du rayonnement solaire incident en ondes courtes à partir d’images satellitales, 2004, Thèse de doctorat, Ecole Nationale Supérieure des Mines de Paris – Sophia Antipolis, 138 pp. Mueller R.W., Dagestad K.F., Ineichen P., Schroedter M., Cros S., Dumortier D., Kuhlemann R., Olseth J.A., Piernavieja G., Reise C., Wald L., Heinnemann D., Rethinking satellite based solar irradiance modelling – The SOLIS clear sky module, Remote Sensing of Environment, 91, 160-174, 2004. Cros S., Mayer D., Wald L., 2004, The availability of irradiation data, International Agency for Energy, Task II – Operational Performances of PV Systems, Report IEA PVPS T2-04, Vienna, Austria, 32 pp.